Around the 16th century, Spanish explorers brought landrace goats from their native lands to the Caribbean Islands and areas that would later become the United States and Mexico. Some landrace Spanish goats exist in their native territory of Spain but survive through the bloodlines brought to the New World. Spanish goats are hardy and can thrive in difficult environments. Pure Spanish goats have been crossbred with imported goat breeds for cashmere and meat production. The Spanish goat has the ability to breed out of season, and is an excellent range animal because of its small udder and teats. In addition, Spanish goats are very hardy, able to survive and thrive under adverse conditions, with only limited management inputs. Within the general group of what are called "Spanish goats," there are those that are purely of Spanish origins, but the term has been used to represent an amalgam of all genotypes introduced to the area. There have been obvious infusions of dairy and Angora blood in many "Spanish" herds, but no organized attempt has ever been made to use them for milk or mohair production. In recent years, the escalating demand for goat meat has focused research into the qualities of the Spanish goat as a meat goat. Spanish goats have shown excellent hardiness and have shown themselves to be a low-input goat compared to other meat breeds. Several Spanish goat producers in Texas have been intensively selecting for increased meat production for the past several years. From information obtained from these producers, these "selected" Spanish goats appear to greatly outperform the ordinary Spanish goat used primarily for pasture maintenance. 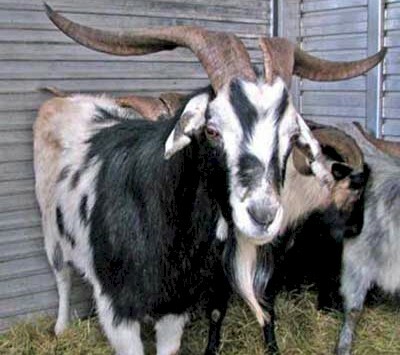 When Boer goats were introduced into the United States from South Africa in the 1990s, many producers switched from raising Spanish goats to raising Boer or Boer crosses, which greatly reduced the population of Spanish goats. In 2009, there were approximately 8,500 purebred Spanish goats nationwide.